Mr. Karp serves as counsel to numerous franchisee associations in such chains as 7-Eleven, Choice Hotels, Hardee’s, Popeye’s Louisiana Chicken, Long John Silver’s, TCBY Yogurt, Midas, Portable On Demand Storage, Krystal Restaurants, Jackson Hewitt, Get In Shape For Women, Pet Supplies Plus, Dale Carnegie, Remedy Staffing, Resort Maps, and Massage Envy. In that capacity, he provides a broad range of advice and guidance to the leadership of the associations on matters including the franchise disclosure documents, franchise agreements and issues that affect the relationship between the franchisee community and the franchisor as well as vendors and suppliers to the system. He has represented franchisees throughout the country in a myriad of franchise issues including sales, purchases, relocations, remodels, transfers, defaults and terminations and lease issues. 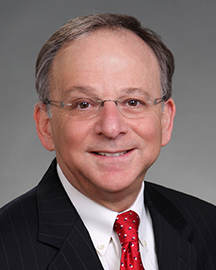 Mr. Karp is the Chair-Elect of the Governing Committee of American Bar Association (ABA) Forum on Franchising, served as its Finance Officer from 2011 to 2016 and was the Co-Chair of the 2013 Annual Forum on Franchising meeting. He was also Editor-In-Chief of The Franchise Lawyer from 2008 to 2010 and has served on the Section Officers Council of the ABA since 2010. Mr. Karp served on the Board of Directors of the American Franchisee Association (AFA) for ten years. Mr. Karp also served as Chair of the AFA Model Responsible Franchise Practices Act Committee, was the principal author of the Model Act and served as the Program Chair of the 1999 AFA Franchisee Legal Symposium. Mr. Karp was a member of the American Association of Franchisees and Dealers (AAFD), a member of its Fair Franchising Standards Committee and Co-Chair of the AAFD 17th Anniversary Conference and Franchisee Leadership Summit in May 2009. In June 1994 Mr. Karp testified before the U.S. House of Representatives Small Business Committee on "Self-Regulation of Franchising: The IFA Code of Ethics." An elected delegate to the 1995 White House Conference on Small Business, Mr. Karp has three times testified before committees of the Massachusetts Legislature on franchise issues, most recently in June 2011. Mr. Karp has provided advice and assistance to the U.S. House Judiciary Committee and its staff on proposed federal legislation on franchising. Since 1996 Mr. Karp has served on the Franchise Project Group of the Franchise and Business Opportunities Committee of the North American Securities Administrators Association. He has six times been a presenter at the ABA Forum on Franchising, thrice at the International Franchise Association Legal Symposium and was an active participant in the debate over the revision of the Federal Trade Commission’s Franchise Disclosure Rule from 1997 to 2007. Mr. Karp has been a guest lecturer at Babson College in its MBA program on franchising. Mr. Karp serves as a member of the Council of Advisors of the Gerson Lehman Group, an independent primary research firm serving domestic and international business and investment leaders, providing advice and consultation on franchise issues and relationships. Advanced Drafting of Financial Performance Representations (co-author), American Bar Association Annual Forum on Franchising, 2016. “A Proposal for a Mandatory Summary Franchise Disclosure Document” (co-author), ABA Forum on Franchising, Franchise Law Journal, Spring 2016. Franchisee Associations, Friend or Foe? (co-author), International Franchise Association Legal Symposium, 2016. Franchising Reconsidered: Will the NLRB Fundamentally Change the Franchise Industry? (co-moderator), American Bar Association Annual Forum on Franchising, 2015. Encroachment Issues Around the World, (co-author), International Journal of Franchising Law, Volume 13, Issue 1, 2015. Franchise Law Demystified (co-author), Massachusetts Continuing Legal Education, 2015. ·Ethical Quandaries in the Franchise Relationship (co-author) American Bar Association Annual Forum on Franchising, 2014. ·“NASAA’s Model Franchise Exemptions: Game Change or Much Ado About Nothing?”, (co-author) ABA Forum on Franchising Franchise Law Journal, Spring 2013. Universal Franchisee Bill of Rights (co-presenter), Coalition of Franchisee Associations, 2013. Covenants Against Competition in Franchise Agreements, Massachusetts Chapter Author, American Bar Association Forum on Franchising, 2012. The Massachusetts Fair Franchise Act (proposed), Commonwealth of Massachusetts, Joint Legislative Committee on Community Development and Small Business, 2012. Federal and State Franchise Rule Enforcement, Panel Moderator, Coalition of Franchisee Associations, 2012. Best Practices in the Use of System Advertising and Marketing Funds (co-author), American Bar Association Annual Forum on Franchising, 2011. ·Procedural Unfairness in Franchise Agreements, Commonwealth of Massachusetts, Joint Legislative Committee on Community Development and Small Business, 2011. The Franchisor in Play; Your Role As a Stakeholder, Coalition of Franchisee Associations, 2011. ·Behind the Counter-The Untold Story of Franchising (interviewee), MSNBC, 2010. ·Fundamentals of Franchising: Representing Franchisees, American Bar Association Annual Forum on Franchising, 2010. ·Your Franchisor Has Been Sold: Now What?, American Association of Franchisees and Dealers, 2010. ·Privilege Issues for Franchise Counsel: Recent Developments (co-author) American Bar Association Annual Forum on Franchising, 2009. Mastering Cooperation and Unity, AAFD 17th Anniversary Conference and Franchisee Leadership Summit, May 2009. The New FTC Franchise Rule and Keeping your Association on the Fairway Re-modeling and Re-imaging in Today’s Economy, AAFD 16th Anniversary Conference and Franchisee Leadership Summit, May 2008. Restoring the Status Quo Ante: Rescission and Restitution in Franchising (co-author), American Bar Association Annual Forum on Franchising, 2007. “Regulation FD: A Roadmap To The Promised Land in Franchisor-Franchisee Communications and Collaboration” (co-author), ABA Forum on Franchising Franchise Law Journal, Winter 2007. The New FTC Rule: Fundamental Change or Fine Tuning? (co-author), American Bar Association Annual Forum on Franchising, 2005. Discriminatory Treatment of Franchisees (co-author), American Bar Association Annual Forum on Franchising, 2004. “Franchisee Associations See Item 20 Disclosure as One Step Forward, Two Steps Back”, Leader's Franchising and Business Law Alert, 2004. “Franchise Affiliation: Eyes Wide Open”, Realtor Magazine, August, 2004. Franchising: Once You Start, Can You Stop" Leader's Franchising and Business Law Alert, 2003. “Mediation: Is Everyone on the Same Page?”, Franchise Times, 2001. “The Case for Federal Pre-emption”, Leader's Franchising & Business Law Alert, 2000. Franchise Agreement Enforcement and State Relationship Laws, (co-author) International Franchise Association Legal Symposium, 2000. “Franchisee Rights to Freely Associate Bolstered by Legislation and Courts”, Leader's Franchising & Business Law Alert, 2000. How, When and Why to Form an Independent Franchisee Association, AFA Legal Symposium, 1999. Marketplace Monopoly - How, Pizza Franchisors Play the Game, AFA Legal Symposium, 1999. Fundamentals of Pre-Sale Franchise Disclosure, Massachusetts Continuing Legal Education, 1999. Mediation, An In Depth Analysis, American Bar Association Annual Forum on Franchising, 1998. The Use of Little FTC Acts in Franchise Relationship Litigation (co-author), International Franchise Association Legal Symposium, 1998. The Formation of a Franchisee Association, AFA Legal Symposium, 1998. Franchise Terminations, Transfers and Renewals, AFA Legal Symposium 1998. Franchising, A Business Alternative, Boston Minority Business Development Center, 1995. Leasing and Operational Issues in Franchising, American Franchisee Association Convention, 1995. Mr. Karp has been quoted in numerous media, including MSNBC, The Wall Street Journal, USA Today, The Boston Globe, Franchise Times, State House News Service, CCH Business Franchise Guide, Continental Franchise Review, Optometric Management, Vision Monday, Success Magazine, Smart Money Magazine, Fortune Small Business Magazine, Realtor Magazine, Income Opportunities Magazine and Entrepreneur Magazine. Mr. Karp is a graduate of Boston University and Boston University School of Law. Sign up our "Franchise Law Newsletter"